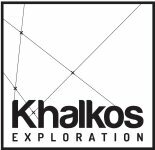 MONTREAL, QUEBEC--(Marketwired - July 5, 2016) - Khalkos (TSX VENTURE:KAS) announces that more than 1,000 metres of diamond drilling will be undertaken in upcoming days on the Malartic property, Révillard part. This first drilling campaign aims to investigate the auriferous potential under the main stripping zone of Révillard showing. No drilling was executed under this stripping zone with an area of around 3,000 square metres on which around one hundred twenty-five linear metres of channel sampling were undertaken in 2006. Samples collected during these fieldworks yielded the following results: 200 samples ranging 0.01 g/t Au to 1 g/t Au, 70 samples of 1 to 3 g/t Au, 35 samples of 3 to 6 g/t Au, 19 samples of 6 to 10 g/t Au and 10 samples of more than 10 g/t Au (reference press release of Britannica Resources of 18 July, 2006). Ten short drill holes will be undertaken directly under the stripping zone in two different directions. The first direction aims to validate the grade and the thickness of the principal shear zone while the second will allow to validate the presence of high-grade gold, sulphide veinlets oriented in an another direction than the shear zone itself. The main shear zone is located at the contact of mafic volcanic rocks of Blake River Group and sedimentary rocks of Kewagama Group. The president of the Company, Robert Gagnon, states that it is exceptional that a junior company is able to survey a gold surface showing of this amplitude which still has not been tested by drilling in one of the most important mining camps in Canada. The Malartic property is constituted of 3 different, contiguous parts for a total of 82 claims located in between the Marban East and Marban West properties of the Osisko Mining company. The Company wishes to announces the resignation of Mr. André Proulx from its Board of Directors. The board of Khalkos would like to thank M. Proulx for its two terms as director of the Company.